315 other birds have this item in their bag or wishlist! Keep it simple and casual this summer with the Jerris Leather Flat Sandal. 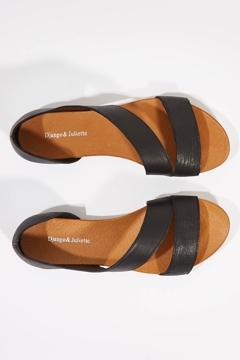 These versatile sandals from Django & Juliette feature a soft leather upper on a foot caressing footbed, sigh....You can feel your feet saying thank you! Coming in a black or tan - the choice is yours! After reading other reviews that these shoes were on the wide side I thought I would give them a go. They are great! So comfortable for my wide foot, they fit comfortably over a (very flattering) bunion. I wore them for 3 hours, straight from the box with no rubbing or blisters. Great purchase to wear through summer. Another great shoe from DnJ. This one a little wider and larger than others I've bought. I'm size 8.5 and usually go up to 40 in this brand but this time went with 39 and fits well although a little bit wide. Don't think they'd work for a narrow foot. I love these sandals - so comfortable. Will be taking these on my next holiday! These shoes are super comfortable from first wear. Great fit, great colour. What a great pair of shoes. I so very rarely buy shoes online but after much frustration gave these a go... so pleased I did! Comfy, well made, great fit... all round terrific purchase. thank you girls at Birdsnest! I wasn’t disappointed when I tried this shoe. I have wider feet and they fitted my width just fine. Not sure but I may need a heel grip. Looking forward to wearing these a lot. The most comfortable sandals I have ever worn in my life!! Highly recommend - I wear them every day. Quick delivery as always. Stylish comfortable sandal. Can’t wait for warmer weather so I can wear them. Really instantly comfortable sandals, casual, great for summer, and look great too. Lovely sandals comfortable first wear generous sizing not too tight love them .